Last week all of our 80’s fashion dreams came true when Melbourne based cool kids Goldie + Ace launched their new AW19 collection ‘Almost Famous’! A collection inspired by the designers childhood and their constant desire to create gorgeous quality threads, the new collection is as cool as it is comfy. 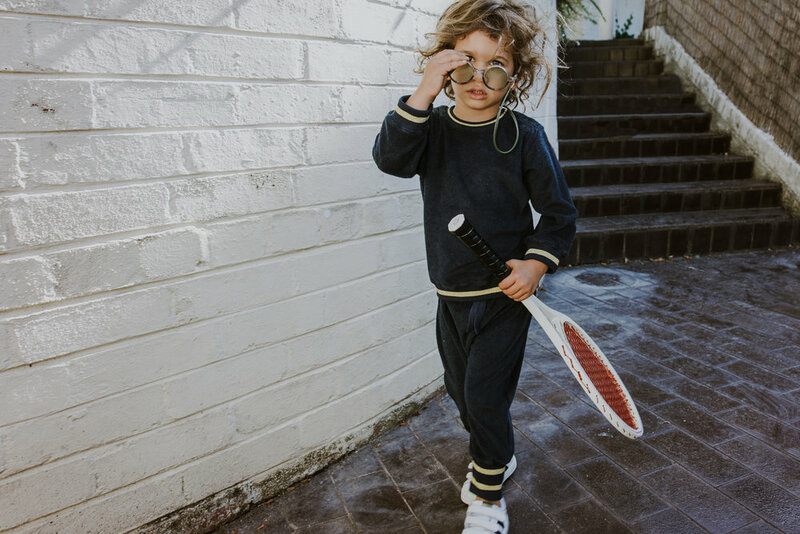 Think terry toweling tracksuits, lightweight linen and soft stretch cotton jersey pieces that you will love just as much as your kids. Some of our favourites from the collection (which were hard to choose) are the Rainbow Wool Knit Sweater, Cali Wool Overalls, Hello Sunshine Zip Growsuit and The Harper Corduroy Pinafore Dress in Rose. Styles that are easy to wear all year round, made to layer for the cooler months and so effortlessly cool your kids will have a better wardrobe than you! (swoon) The duo also take sustainable measures by working with local artisans creating beautiful prints and characters that you will see throughout their collections. Cali Wool Overalls, Goldie + Ace AW19. We love the work Chris & Alana (designers and creative genius duo behind Goldie + Ace) are doing in creating an incredible brand with their main philosophy being one of quality over quantity, buy less, wear it more and pass it on. All the collections are created using the softest yarns and dyes to care for young skin and all clothing is manufactured by Oeko Tex certified skilled artisans. This means no harmful substances are used in the production of the clothing!! We love these guys and what they are doing so much within the fashion space that they are featured in Issue #2 in a beautiful collaboration piece about the movement of inclusion in the fashion industry and celebrating individuality, diversity and inclusion.